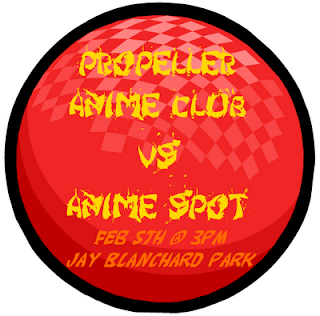 Propeller Anime: Propeller Anime Club vs Anime Spot: DODGEBALL!!! Propeller Anime Club vs Anime Spot: DODGEBALL!!! The day of destiny is coming fast! Propeller Anime Club and Anime Spot have selected the members of their respective dodgeball teams and both teams have trained hard for victory! But there can only be one victor and one supreme anime club in all of Orlando. Which one will it be? The game is scheduled to start at 3PM in Jay Blanchard Park on Dean Road. You will be there and will cheer loudly for blood and violence! The match will be determined by the team to reach three (3) wins first and they must be ahead by two (2) games in order to claim victory. Afterwards, casual dodgeball play will be available to anyone who wants to play. Niether club will assume responsibility for any injuries you might recieve at the park on February 5th. Next club meeting on Sunday, January 23rd! Recap of the last meeting! 1/9/11 edition! Orlando Anime Day #3 Outing! GANTZ live action movie outing on January 20th! First Meeting of 2011 on Sunday, January 9th!